It's a new year and it's a time for resetting and restarting. After all the unhealthy eating I indulged in last year, I wanted to start the new year right by eating some healthy food. The Vegetarian Kitchen had a whole new menu of healthy and delicious treats so we couldn't wait to try some of them. As you can see, we had already started on some of the side dishes. We arrived early at the resto and at first we thought it was still closed but the door was opened for us. They had just started prepping for their first opening day in the new year so we had some leisure going through the new menu. There were so many to choose from! I was happy to have so many delicious and healthy choices available so I decided to indulge my craving for some salty and crunchy food with an order of their Southern Fried "Chicken" served with macaroni and grilled corn (Php359). Looks like chicken but tastes better with healthy side dishes too! We first indulged on the grilled corn and the macaroni salad alternately as we waited for the rest of our orders. 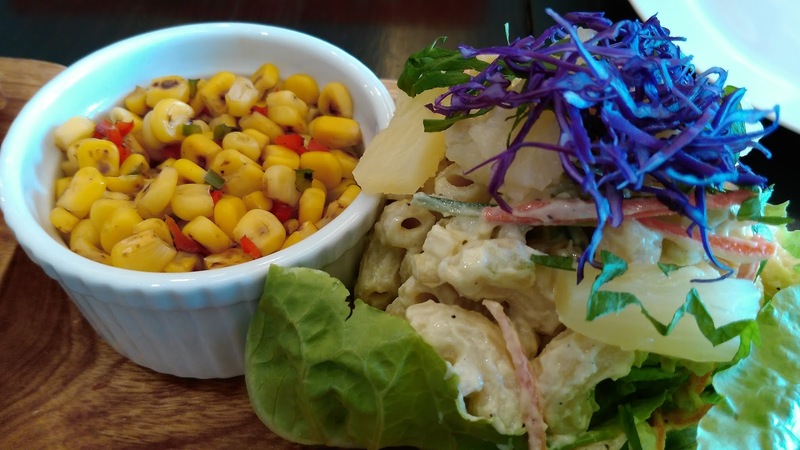 The grilled corn was sweet and crunchy and the macaroni salad had the right balance of creamy and crunchy which whetted our appetites and really made us look forward to the main dishes even more. The leafy greens were an added bonus! Side dishes that you won't even put aside. Delicious and healthy! My new favorite vegetarian fare. My first bite of the "chicken" was very satisfying. This instantly became my new favorite dish! 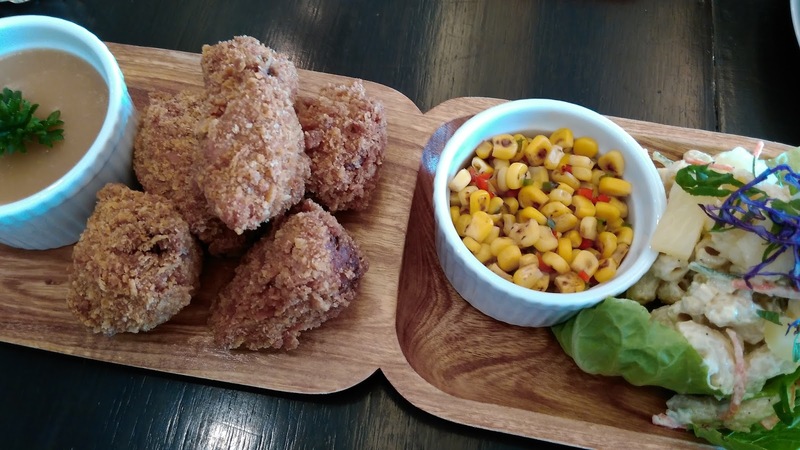 It wasn't as oily as you would expect of fried chicken but the crunchy and crispy exterior was there with the tasty and chewy center. 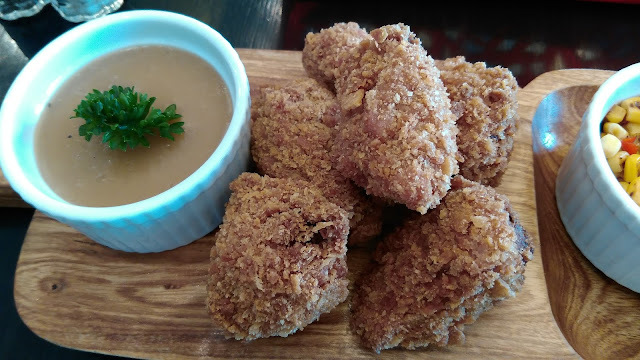 The "chicken" was delicious on its own but the gravy was another delicious add-on as it was less oily and tasted better than the regular fare. We couldn't get enough of this one and would have ordered it again for take-out except we were already full. 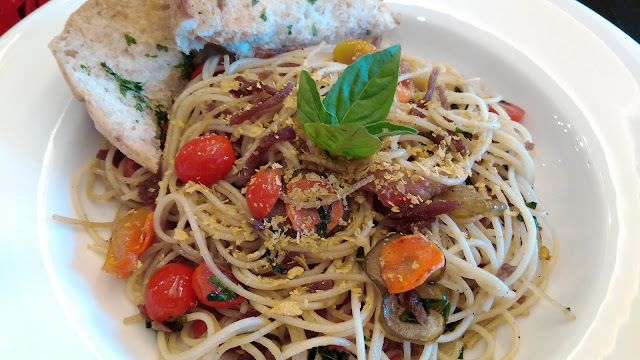 Our next order was the Spanish Soydine Angel Hair Pasta in Olive Oil (Php210) served with parsleyed whole wheat bread. Major points for looking so festive and vegan! I sometimes avoid oil-based pastas because I don't like the oily residue that forms as it gets cold but this version had just the right amount of olive oil. My friend even said it was a bit on the dry side but I appreciated it this way because it didn't give me that heavy, oily feel as I continued to eat. The salty soydine bits and the sweet-sour cherry tomatoes made it impossible for the pasta to stay on the plate too long to form oil residues as we devoured it rather quickly. 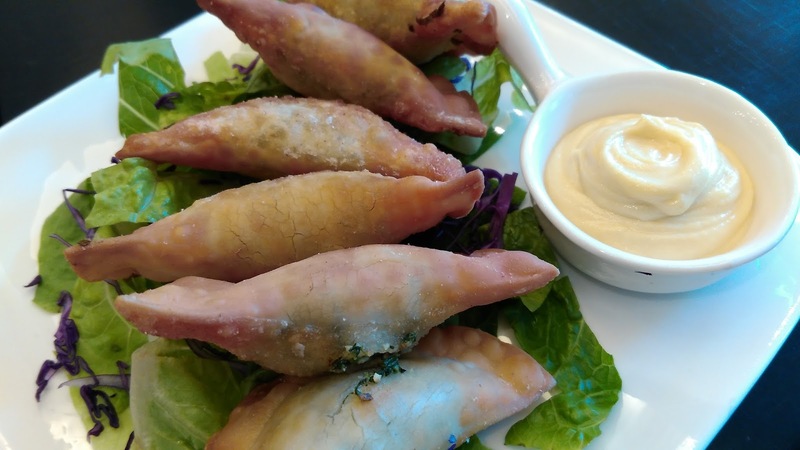 Our last order was the Cream Cheese and Spinach Dumplings (Php214) served with tofu mayo dip. This is supposed to be a starter but we ordered this last. Also, the grilled corn and macaroni salad served as our starter so this became a main treat. Crunchy outside, soft and creamy inside. Just like the "chicken", this had the perfect combination of crunchy and creamy. The tofu mayo dip added even more flavor. Could we order this in a jar please? Since it was on a bed of greens, after we finished off the dumplings; we also paired the greens with the tofu mayo dip and it was a tasty combination. All the dishes could satisfy one person already but there were 3 of us so we decided to order 3 dishes and just share so we could all taste the healthy goodness of these offerings. Plus points for everything being reasonably priced in serving portions that are good for sharing. 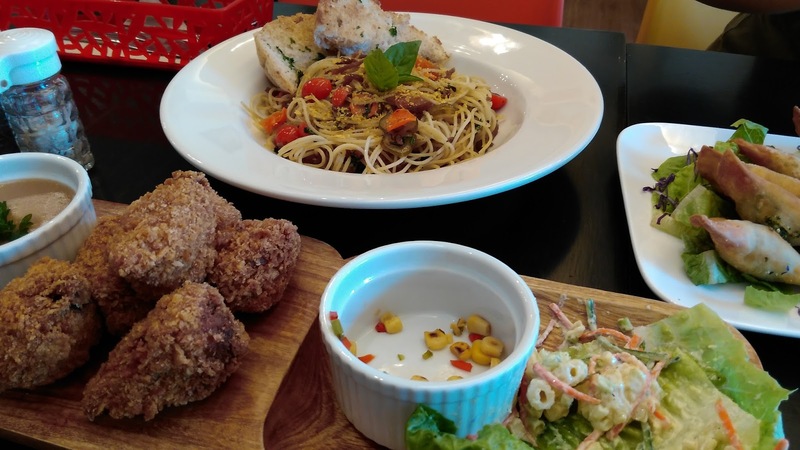 There are still more delicious and healthy dishes on their menu and we are looking forward to trying them out on our next visits. For more updates on their menu, you can visit their Facebook page. They also offer vegan/vegetarian cooking classes which are quite fun and would definitely encourage you to start cooking and eating healthier.